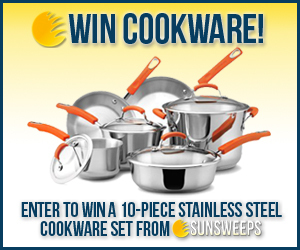 Enter to win A 14-PIECE OF Rachael Ray Stainless Steel Cookware from our friends over at Sun Sweeps. You never know if you are going to win if you don’t enter, right! I used to just pass up giveaways and sweepstakes because I thought my chances of becoming a winner were slim to none. Well, I believed that until one day I just entered a contest and won a $500 gift card! Yeah, since then I said hey you just never know if you’re going to win. However, by not entering I’m guaranteeing I won’t win, so I take my chances and enter and been lucky a few times. It’s totally worth entering. Anyway, sorry long story short head over and enter to win by clicking here.